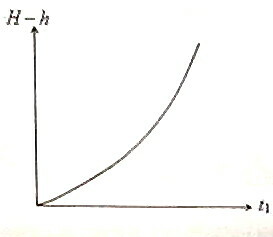 (a) The nature of variation of the displacement H – h suffered by the ball in time t1 is shown in the adjoining figure. 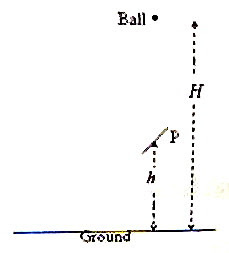 (b) Just after the collision, the ball moves horizontally. Its horizontal velocity component remains unchanged and it picks up vertical velocity (downward) because of the gravitational pull. The path followed is therefore parabolic as in the case of any projectile having two dimensional motion. [Note that the initial vertical velocity is zero just after the hit at the touch plate]. [You might have come across this equation earlier in fluid mechanics. 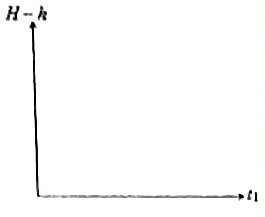 This is the horizontal range of a liquid jet coming out through a side hole in a liquid tank (See the post dated 3rd December 2007)].